Oh My, the wisteria is lovely. I love the color. I don't have a single bloom of anything yet. Snow and frost did in several of the flora around my house. It rained all day yesterday and is cold today. Every plant and tree is confused about which season is which. Feels like Fall here. we're just barely getting daffodils and you have wisteria!? NO FAIR! Our wisteria doesn't even have leaf buds yet! But our fruit trees are in bloom. 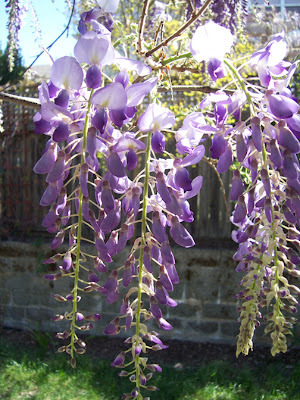 I love Wisteria, but have never had one of my own. I think I should investigate and see if our new place would tolerate one. Thanks for sharing and congratulations on the VK mention! Happy Spring to you! I can look forward to wisteria here in a few more weeks. Wisterias are actually THE sign of spring for me - I love them so much, and whenever I get to see and smell them (we don't have a lot of them over here, unfortunately), I know that spring is here! Thank you for sharing this most beautiful photo and thus cheering me up considerably today! All that green is so pretty. We're still in the very grey stage of Spring. But it's not freezing anymore so I'm not complaining. Oh, gorgeous! I used to look forward to seeing a friend's very old very established very gorgeous wisteria in bloom every year, but she sold her house and moved away... So thank you for the vicarious wisteria-ing for me. Lovely.